This year the Hong Kong International Film Festival paid tribute to Ann Hui, a director with a long track record in the local industry. After an active career in television, directing documentaries and drama, she began making movies in 1979, and has hitherto directed 21 features. Her latest film, July Rhapsody (2001), was selected for screening at both the Sydney and the Brisbane International Film Festival. With four features over the past two years, she shows no sign of slowing down and seems to be at the height of her powers. Unlike many of her compatriots, she has not deserted Hong Kong, where she is highly respected for her intelligence, creativity and commitment to local film culture. The Hong Kong film industry has been most noted for the production of highly entertaining popular genre films – in particular, for frenetically paced martial arts movies, suspense thrillers and ghost stories, all spiced up with comedy and romance – and its flamboyant male directors, Tsui Hark, John Woo and Wong Kar-wai. It is the Taiwanese cinema that is regarded as being more contemplative and of the high art variety thanks in large part to the films of Hou Hsiao-hsien, Edward Yang and Tsai Ming-liang. However, there have always been crossovers – some genre movies made in Taiwan and some art movies made in Hong Kong. Ann Hui’s work sits somewhere in the middle. 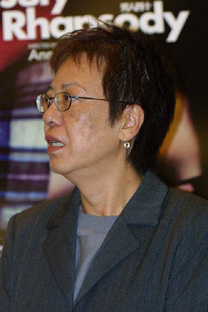 Though she started as an assistant to King Hu on the production of martial arts movies, and subsequently directed a number of genre movies (ghost stories, thrillers and martial arts epics), her best work blends a certain documentary realism with the family melodrama to produce a humanist cinema that centres on the experience of women in the home and the world (to borrow a phrase from Tagore). And, though she was associated with Hark and Woo as one of the prime movers of the New Wave in Hong Kong filmmaking, her work is distinctively different from theirs in its thematics and stylistics. While they have devoted their creative talents to the kinetics of movement, action and the choreography of heroic stunts of performance, with explosive and exhilarating bursts of energy and violence punctuating if not overpowering the masochistic male melodramatics of the narrative, Hui has remained a political filmmaker, concerned with issues of class, gender and ethnicity, with history and memory, with the nexus between the public and private lives of ordinary unheroic people. There is violence in her films, but it is always tied to the social and political abuse of power, and is not endowed with the kind of aesthetic and emotional fascination that it has for Woo and Hark. Soon after her return from England, where she studied filmmaking, Hui worked for Hong Kong television, directing documentaries about social protest action as well as episodes of drama series, and this background in documentary and political activism has inflected her later feature films. Her recent film, Ordinary Heroes (1999), is a tribute to the social activists of Hong Kong in the ’70s. Her Vietnam trilogy of films – The Boy from Vietnam (1978), The Story of Woo Viet (1981) and The Boat People (1982) – dramatizes the trials and tribulations of Vietnamese refugees and condemns the Hong Kong authorities for failure to help them. Interestingly, it is a Japanese photojournalist (himself a war orphan) who in The Boat People becomes committed to improving the refugees’ welfare and finally sacrifices himself to help them escape. This casting of a Japanese as investigative and sacrificial hero is interesting because of Hui’s own background, as the child of a Japanese mother and Chinese father. Her family background perhaps also helps to explain her interest in displaced and marginal people, her horror of nationalism and ethnocentrism. In The Boat People, she shows how the ethnic Chinese were targets of government oppression in post-liberation Vietnam. In Song of the Exile, she shows how her mother, an ethnic Japanese, was the object of discrimination by her Chinese parents-in-law in post-war China. But Hui is not a didactic filmmaker. She is a narrative filmmaker who situates her characters in the imperfect social world and shows them struggling, and largely succeeding, to survive. Her most recent film, July Rhapsody, known in Chinese as Man of 40, is a companion piece to Summer Snow (1995), with its Chinese title, Woman of 40. Both films centre on a mid-life crisis faced by the protagonist. The crisis is not spiritual or existential but the product of social problems simultaneously occurring on the domestic and work fronts. In Summer Snow, a cheerful, competent and confident working housewife is faced with the downgrading of her status at work as a result of the computerization of business administration and is burdened at home with the responsibility of caring for a difficult widowed father-in-law with Alzheimer’s disease. In July Rhapsody, a respectable, committed and competent teacher of Chinese literature is faced with an attractive student who is infatuated with him at the same time as his wife is nursing her ex-lover and neglecting him. Neither film succumbs to the heavy melodramatic potential of their storylines. Instead, the daily doings and settings of the characters are densely detailed with a kind of documentary realism, and the story unfolds almost casually, with moments of humour and pathos. Hui endows the major characters with vitality and nobility, though she does not shrink from displaying their trying imperfections and aberrations. Nevertheless, Song of the Exile (1989) remains my favourite Ann Hui film. It is her most personal – in fact, it is a fictionalised autobiographical film – and yet it at the same time speaks for countless contemporary women, who identify with the feelings and experiences on show. Song of the Exile is about the problems of the mother-daughter relationship in our time, about the impact of socio-historical forces on private life and the crises of identity ensuing from post-colonial migrations. The classic Hollywood melodrama did occasionally treat the subject of mother-daughter relationships (for example, Now, Voyager [Irving Rapper, 1942], Mildred Pierce [Michael Curtiz, 1945], Imitation of Life [Douglas Sirk, 1958], and Stella Dallas [King Vidor, 1937]) but always accorded it the heavy melodramatic treatment, with villainous mother (Now, Voyager), villainous daughter (Mildred Pierce), or tragic mother sacrificing herself for her daughter’s welfare (Stella Dallas). These classic Hollywood melodramas were also clearly situated within patriarchal ideology, according to which the dyadic relationship between mother and daughter is abnormal and unnatural, one that must be ruptured, as a woman’s primary attachments should be with men (fathers, lovers, husbands, sons). Song of the Exile departs radically from the Hollywood norm in having no heterosexual romance or love affair to intervene in the mother-daughter relationship. The struggle for the daughter’s affection is between the mother and the grandparents, and this conflict in Hui’s perspective is grounded in socio-political issues (cultural difference, political conflict, nationalism) rather than in psychoanalytic ones. The grandparents claim her as a Chinese and seek to wrench her from the influence of her mother, their Japanese daughter-in-law. They try to instil in her a love of Chinese culture (language, literature, food) and secure her identity as a Chinese. Gillian Armstrong’s High Tide (1987) dramatised a young woman’s conflict between attachment to her mother and grandmother but (i) there was no ethnic difference complicating the conflict; and (ii) the mother had abandoned the child and had previously not claimed her, so that the melodrama centres less on the daughter’s conflict or the conflict between mother and grandmother than it does on the mother’s awakening to her maternal instincts, to the triumph of nature over nurture (1). 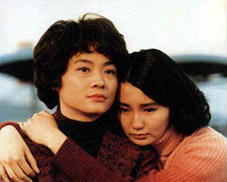 Song of the Exile is set in the 1970s but is punctuated with flashbacks to the past, signalled by voice-over as memories of Hueyin (Hui’s stand-in, played by Maggie Cheung) or (in the case of events that happened before her birth) as enactments of her uncle’s and mother’s memories. The film begins in London, where Hueyin has been studying and fails to land a job at the BBC, and soon moves to Hong Kong, whence she returns to attend her sister’s wedding. The early scenes of conflict and tension between her and her widowed mother, Aiko (played by Hsiao Feng-lu), centre on issues of dress and grooming for the wedding (mother pressures her to wear a red dress and have her hair permed). The troubled relationship between them seems initially to stem from a generation and education gap. Mother appears to be an empty-headed bourgeoise, only interested in her appearance, her clothes, playing mahjong and seeing her daughters married. Huejin, her elder daughter, is an educated young woman, interested in the world, in politics and culture. This initial conflict is one only too familiar to tertiary-educated, middle-class women in the developed world who matured in the 1960s and ’70s and found a large gap between their mothers’ horizons and values and their own. Early flashbacks prompted by Hueyin’s resentment towards her mother over the dress and hair issues show mother causing her distress as a child by cutting her hair short and making her wear a sailor suit to school, ignoring her protestations. But later flashbacks provide a more sympathetic view of the mother, as it is revealed that she suffered oppression from her Chinese parents-in-law. Retrospectively, we can understand that the mother was merely following Japanese tradition in preparing her daughter for school (with the statutory short hair cut and school uniform). It gradually becomes evident that the main obstacle to mutual respect and affection between mother and daughter is nationalism. The child Hueyin, under the sway of her paternal grandparents, had rejected her Japanese mother and identifies herself as a Chinese. Though her mother and her grandparents become disillusioned with their respective nations by the end of the film, the damage has been done. The more common tensions between mothers and daughters (due to different levels and types of education, differing views on the role of women, traditional feminine vs. feminist ideologies, as well as psychological factors) are here exacerbated by the introduction of a cultural clash rooted in traumatic historical friction. China and Japan were literally at war in the first half of the 20th century; Chinese populations and territories suffered greatly under the conquest and rule of the Japanese; Chinese nationalists and communists were united in their hatred of the Japanese. So young Hueyin, who absorbs Chinese patriotism from her nationalist Chinese grandparents, has a real problem accepting her Japanese mother. But, in the second half of the film, Hueyin accompanies her mother on a visit to Japan, her mother’s homeland, and learns what it is to be a stranger who cannot speak the local language and is unfamiliar with the local customs. Her mother too becomes disillusioned with her homeland and is cured of her nostalgic longings, no longer feeling at home there. She comes to recognise that Hong Kong is her home now. Hueyin also has learnt to distrust Chinese nationalism and decides to settle and work in the colony of Hong Kong. So, the rapprochement and ultimate reconciliation between mother and daughter is made possible by mutual recognition of a precarious common “homeland” (a British colony that will be returned to China in 1997), by both abandoning their nostalgic stances as exiles, and by common experience of being situated as outsiders. Hueyin has put herself in her mother’s place and no longer resents her, can now empathise with her. Hui studied comparative literature at university before she went to London to study filmmaking, and did her thesis on the fiction of Alain Robbe-Grillet. Though her formal style is far from avant-garde, we may observe a debt to the French nouveau roman in her interest in memory and her evocative and cerebral use of the telling detail, in the echoes and repetitions that chime through her work. Song of the Exile opens and closes with a bridge across water; the film is punctuated by journeys, on bicycle, train and ship, and by departures and farewells. The opening scenes in London introduce the motifs of the bridge, the bike-ride and the necklace. Hueyin rides her bike across Westminster Bridge and through the city streets; later, in Japan, she rides a bike through the Japanese countryside. She lends her English girlfriend her necklace to wear to a job interview; her mother gives her necklace to Huewei, Hueyin’s sister, on her marriage. In both cases, Hueyin is the loser – unlike her English girlfriend, she fails to land an interview with the BBC; unlike her sister, she fails to be recognised as a dutiful daughter by her mother. Partings are most prominently featured. First Hueyin’s parents then she herself leave Macao for Hong Kong; her sister and brother-in-law leave Hong Kong for Canada; her mother farewells her parents at their graveside on her return to Hong Kong; Hueyin parts with her grandparents in Guanjo, in mainland China, to return to Hong Kong. The film closes with a sombre shot of the bridge that connects Hong Kong to the mainland, a bridge that has personal and political connotations, linking Hueyin to her grandparents on the mainland and Hong Kong to the mainland regime that will reclaim Hong Kong in 1997. In the film, language and food are highlighted as barriers and bridges between people. In Macao, the young Japanese mother is ostracised because of her inability to speak Chinese and to cook in the Chinese manner. In Japan, Hueyin can only communicate via English or limited Mandarin. The mother’s abandonment of the stance of a nostalgic exile is signified by her farewelling her parents at their graveside in Cantonese; she had greeted them on her arrival in Japanese. Japanese food has also lost its appeal for her. Clear parallels are made in regard to the language barrier, with both mother and daughter in turn excluded from comprehension and communication, mother in Macao, Hueyin in Japan. Mandarin supplies a bridge between Hueyin and the Japanese uncle who had lived in northeast China during the war; English is a bridge between her and some educated young Japanese. Her father is a professional interpreter – a bridge between peoples of different language and culture. The Japanese uncle is another bridge. In Mandarin, he tells Hueyin about her mother’s early life and the family’s experiences in Manchuria during and after the war. But generally the language barrier produces misunderstandings and tensions in the Japanese section of the film. Hueyin does not understand her aunt’s fears and suspicions about her mother’s intentions and is unable to placate her; and she misinterprets a farmer’s friendly gesture and reads it as a rebuke, inspiring fear of punishment. The voice-over narration and flashbacks provide an autobiographical as well as retrospective cast to the film. The flashbacks recast the past into short dramatic scenes that explain the early rift between mother and daughter and highlight the pain and distress on both sides. Though the film is explicitly made from the daughter’s point of view, the flashbacks increasingly become more empathetic with the mother, stressing her isolation and suffering, her cruel rejection by in-laws and elder daughter. Mother and daughter are expressly (and very expressively) linked in the central ferry shot. First we see mother sadly looking into the water, on her way to Hong Kong, distressed at leaving her daughter in Macao; the mother’s view of the water as seen from the moving ferry then dissolves into Hueyin’s view of it some years later, when she is on her way to re-join her parents in Hong Kong, leaving her beloved grandparents behind. Grandpa is associated with the culture and arts of Old China: classical poetry and calligraphy. Though a Chinese patriot, who returns to the mainland after the Revolution, he is shown to be cruelly disillusioned, for the New China does not value the culture dear to him. At the end of the film, when Hueyin visits her grandparents on the mainland, he is dying, and is distressed by the policies of the Cultural Revolution, a disillusioned man but still a patriot who hopes things will change for the better. However, Hui suggests this is unlikely. The little boy her grandmother is looking after bites the hand that feeds him; and a cold front is approaching. These events function as pessimistic and prophetic metaphors, not optimistic of the future. The final image of the film – of the dark bridge over the water at the border – is also rather gloomy. It can be read as a personal and political metaphor. As the link between the Chinese mainland and Hong Kong, it prefigures the imminent 1997 re-incorporation of Hong Kong into the PRC; the bridge also perhaps signifies the re-established link, the end of the Cold War, between mother and daughter. Mother, however, has turned old and quiet; she has lost her spark; the fighting spirit has gone, so the reconciliation is tinged with sorrow, and not signified as a triumph. Furthermore, under the shadow of 1997, a contingent and uncertain future awaits Hueyin in Hong Kong. Interestingly, Song of the Exile kills off the patriarchs: Father is a minor shadowy figure in the flashbacks, no longer alive in the present of the film; Grandpa is ultimately impotent as well as disillusioned. Hui here seems to be positing an alternative world of strong and enduring women, disrupting patriarchal and patrilineal conceptions of nationality and filiation. However, she is by no means a man-hating feminist. If men do not figure strongly in this film, they certainly do in her recent films. She portrays the difficult old man in Summer Storm with sympathy and warmth, and positively celebrates the understanding and attachment that develops between him and his feisty daughter-in-law. In July Rhapsody she portrays with sympathy the trials and tribulations of a married man who, somewhat reminiscent of Grandpa in Song of the Exile, is an inspirational teacher of classical Chinese literature. The central concern with the mother-daughter relationship in Song of the Exile can be likened to a similar concern in diasporic Chinese autobiographical women’s literature – the many memoirs and novels published in Britain, Australia and the US. In these books, the rebellious and liberated daughters tell the stories of their suffering mothers and grandmothers, and exorcise their guilt by paying them tribute. They highlight the tensions between the generations, and underline the suffering of women under Oppressive Old China, in contradistinction to the Free Modern West. They also highlight the betrayal of liberationist policies in modern China, where political idealism is cruelly betrayed by successive waves of political oppression. Although there are points of similarity, I find Hui’s representation of the mother-daughter relationship and of political matters more subtle and nuanced than theirs. She is less prone to indulge in melodramatics and extreme binary oppositions. In Australian independent cinema, there has been a distinct genre of autobiographical women’s films, but they are mostly short films, on the experimental edge, employing re-edited pre-existing footage from the family album and home video or detailing empty interior landscapes, with the autobiographical discourse narrated by an off-screen woman’s voice (2). The commercial branch of the industry has also produced features based on Australian women’s autobiographical fiction – My Brilliant Career (Gillian Armstrong, 1979), adapted from Miles Franklin’s autobiographical novel; The Getting of Wisdom (Bruce Beresford, 1977), adapted from Henry Handel Richardson’s thinly disguised account of her early life; and We of the Never Never (Igor Auzins, 1982), based on Mrs Aeneas Gunn’s account of her life on an outback cattle station. They are notably all period films inflected by a liberal feminist agenda. But none of these films, experimental or commercial, is centrally concerned with the mother-daughter relationship and Corinne Cantrill alone has addressed the issue of cultural difference generating tensions in the family. Song of the Exile deserves a wider audience. A mainstream commercial film starring the magnificent Maggie Cheung, it is an intelligent and moving woman’s film, addressing the nexus between the public and the private, the personal and the political, the local and the global in our time. Interestingly, the sea figures prominently in both High Tide and Song of the Exile, although it is raging surf on the shoreline (a melodramatic cliché) that features in the former and calmer deep water (associated with introspection as well as maternity) in the latter. Notable examples of the genre are Jenny Thornley’s Maidens (1978), Merilee Bennett’s A Song of Air (1987), Corinne Cantrell’s In This Life’s Body (1984), Gillian Leahy’s My Life without Steve (1986) and Marie Craven’s Pale Black (1993).